Ashwineee Bhatt, 76, a best seller novelist of Gujarati, passed away in Dallas (US) on Monday. He was one of the rare writers who had made a living out of writing novels in a language where sale of 1,200 copies of a book is considered good. His commercial success was close to none in Gujarati in recent times. Circulation of newspaper/magazine carrying Ashwinee Bhatt's serialised novel would shoot in five figures. His novels, many of them in two voluminous parts, had magnetic effect on three generations of Gujarati readers. Sale of his novels remained unaffected even when he had not written a single novel in the last decade. Son of an eminent educationist Harprasad Bhatt, Ashwinee graduated in psychology. His first love was theatre. He started as a child artist and earned appreciation of Sisir Kumar Bhaduri for a role in Gujarati adoption of Bengali drama 'Bindur Chhele' (Bindu No Kiko) during one of the shows at Kolkata. He ventured into number of business before taking up writing career. His failure in business as varied as a poultry farm to a vegetable vendor did not take away his jovialness and enthusiasm mixed with the ethos of old-time Ahmedabad. He took up translation of the novels of Alistair McLain, James Hadley Chase among others. His Gujarati translation of 'Freedom at Midnight' was a best seller and got wide appreciation. Besides writing, he joined many causes without claiming for the activist-writer label. He was one of those few Gujaratis who stood with Medha Patkar in Narmada Bachao Andolan against Chimanbhai Patel government and bore the brunt of it. He had planned a novel on the same subject namely Jalkapat (fraudulent waters) that didn't materialise. His bunglow, 65, Brahman Mitramandal Society, Ellisbridge, now converted in to apartments after he sold it few years back, was an open place for all kinds of activists. He empathised with dalit and adivasi issues with equal openness. His health suffered considerably in the last few years after having undergone bypass surgery and having a pacemaker. He was staying with his wife and son in the US for longer periods and even started writing in English. 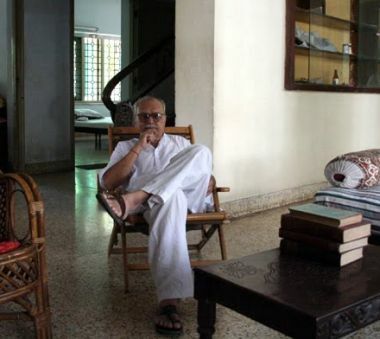 During his last visit to Ahmedabad in March 2012, he showed five chapters of a new novel based on terrorism, written with the same rigor that made him what he will be remembered as -- a cult writer who made thousands of Gujaratis read marathon novels and asking for more.